Bare with us for a second, close your eyes, and mentally list 10 things your really, really like. Okay one thing we’re sure of is that free stuff was included in that list (and if it wasn’t, then what is wrong with you?! seriously). We bet you also thought of music, art, and action … not that kind of action, pervert. Well, maybe just a little. If none of these things popped into your head then you may as well stop reading now because clearly this event is of no interest to you — but I bet you won’t be able to stop, now that we’ve provoked you. To the point! 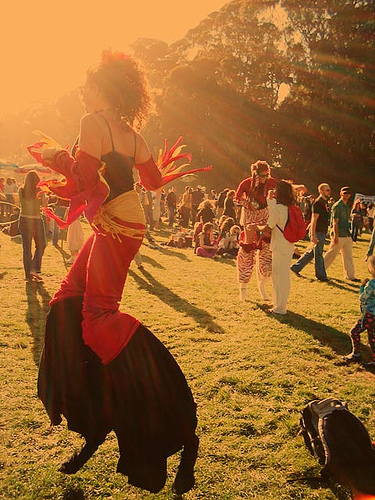 Power to the Peaceful is an enormous music/arts/dance/peace festival happening in Golden Gate Park on Sept, 10-12. Friday is the pre-party (not free), Saturday is the actual festival (FREE!!) and Sunday is Yoga, Brazilian dancing and family concerts, boooringggg. We recommend Saturday, when you can listen to lots of reggae, including Rebelution, get chur freaks on in the dance tent and get some action, by which we mean all of the above and nothing more. Okay fine, maybe a little. We also wanted to further clarify that the above picture is indeed from a past Power to the Peaceful festival and is also incredibly misleading: real Satyrs do not attend this event, there is probably no such thing as a real Satyr and this woman just felt like being a fun sucker. So, sorry about that.